This man is crying on the inside. 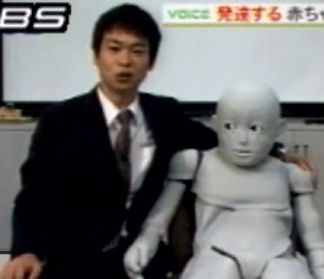 The pasty figure on the right in this picture is “CB2,” a name which is derived from “Child-Robot with Biomimetic Body.”Â This highly advanced robot, meant to mimic the behavior of a human toddler, was created at Osaka University by the Japan Science and Technology Agency.Â It’s body movements and facial expressions are controlled by 52 pneumatic actuators, and it has roughly 200 tactile sensors embedded in its skin.Â It receives input in the form of audio, video, and the aforementioned tactile sensors.Â Though it cannot speak, it does communicate vocally by making a series of squawking sounds.Â Just like a real child.Â The robot’s movement, for the most part, is surprisingly fluid and lifelike.Â It’s all very impressive, technically, but there is one other consensus among those who have seen the videos of CB2 in action:Â This thing is creepy as hell.Â The short stature, overlarge eyes, gray skin, and muted facial features make it look like something that’s about to beam me into its ship and perform orifice-violating medical experiments on me. This robot fell into the Uncanny Valley and hit every rock on the way down. From Daily Yomiyuri, via Endgadget. 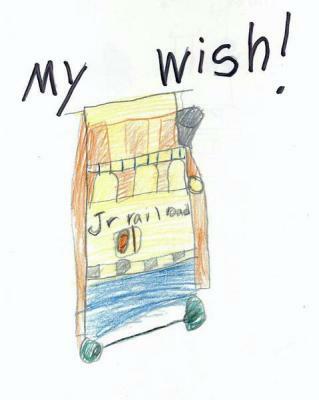 Seven-year-old Jericho Rajninger of Larkspur was diagnosed with leukemia in 2003. Because of the unpleasant task of ingesting more than 4,000 pills during his chemotherapy treatment, Jericho came up with an idea to help himself and other children like him better cope with taking all these meds and make it fun, if not at the very least, more pleasant. The Robot, named after Jericho’s initials – “J.R. 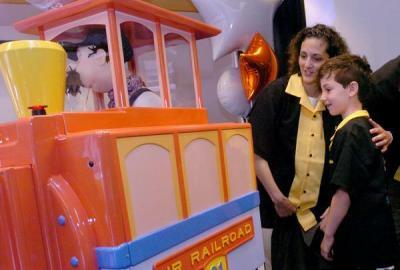 Railroad” was designed to resemble the storybook “Little Engine That Could.” The robot will deliver medication to children being treated for cancer. The train built around the industrial looking robot was designed by San-Francisco based Gensler Architects. Oh yeah, and the conductor in the robot outfitted by The Gap, it does have a voice, not only a voice, but The Voice, Don LaFontaine. According to his physician, Dr. Michelle Hermiston of Corte Madera, currently, Jericho is in remission and doing well.